So Apple finally unveiled the iPhone, or maybe it’s really called the Apple iPhone since they have that apple logo before the name on their site since Cisco (via Linksys) has an iPhone announced last month. One of the disappointments is that it doesn’t include iChat on the phone. I assume this is so Cingular, the iPhone carrier, won’t freak-out that people are making free calls via their Apple iPhone. After all, you’d want to cash in on SMS and long distance calls, something that would be easily done for free if iChat were on the device. Do I want one? Not quite yet. It only has 8GB of memory, can’t IM, isn’t on Verizon Wireless, can’t data connect my laptop and I’m still locked into my current cellphone account anyway. My Treo 650 can do just about everything the iPhone can except WiFi and it doesn’t have that beautiful Apple interface built in. 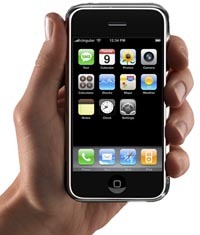 Well, according to Reuters Cisco has decided to sue Apple for calling their phone the iPhone. I predict they’ll just call it the Apple Phone and put their logo before the word phone like they did for Apple TV.